Cedar. Its natural warmth and subtle patterns of texture reflect an older, more relaxed time. 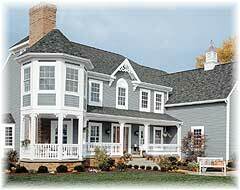 Reminiscence siding from Owens Corning captures the look of traditional hand-cut cedar siding. And while its appearance pays tribute to the past, Reminiscence siding is perhaps best understood as a product of the modern ages. Underlying its timeless style are many technological innovations, each designed to help keep your home looking its best year after year.